I had the opportunity to photograph this gorgeous mama-to-be a few months ago in a relaxed, intimate in-home maternity session with Daddy in their Brooklyn brownstone. I absolutely loved getting to know these wonderful parents-to-be, and I was so excited to meet baby Liam at my Upper West Side photography studio for his classic, minimalist newborn photo session. Mama and I both love clean, classic images so we dressed Liam in a white onesie and styled him with a neutral white wrap. Using this light, bright, neutral color palette allowed us to focus on Liam’s sweet expressions and tiny features. Liam was an absolute dream to photograph! He was so calm and sweet, and I was able to capture some adorable photos of him alert and awake. 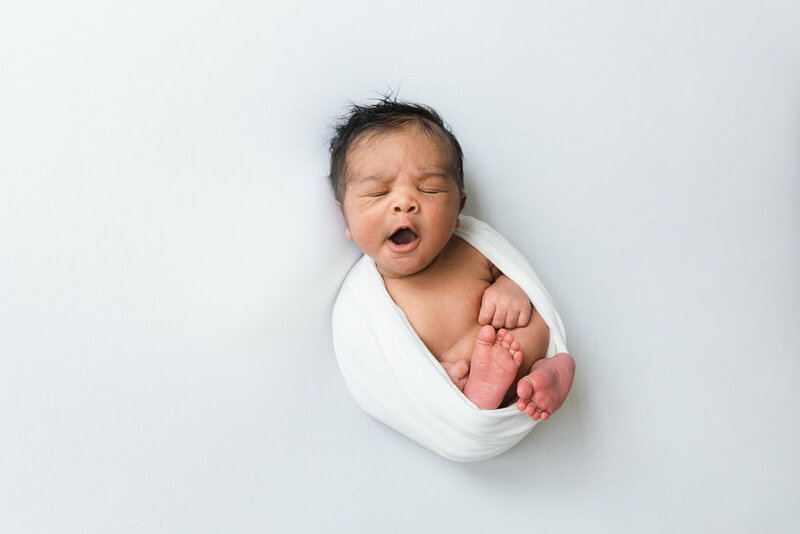 So many newborn photographers hope baby will stay asleep for the entire session, but I try to just go with baby’s mood and hope for a calm, happy baby, regardless of whether they’re awake or asleep. I also love the sweet expressions on a baby’s face when they’re awake, especially when they look right at me. I could just stare into those beautiful baby eyes forever! Liam has the most gorgeous dark hair and eyes, and he made the cutest faces when he was awake. How precious is his smile and his adorable yawn? After some awake time, Liam dozed off and I was also able to capture some very natural, snuggly wrapped images that show off how tiny his little body was in those first few days. Mama was hesitant about being in any of the photos, but I’m so glad she got in the frame because those images with Mama and baby snuggling are some of my favorites from this session! This new mama is absolutely glowing, and you can just see the love she has for her tiny newborn! 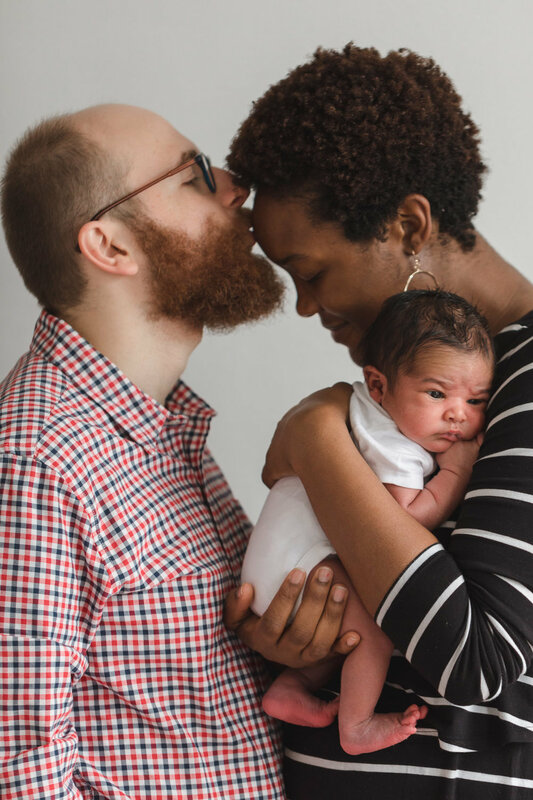 I know it’s sometimes hard, as parents, to include ourselves in the photos, but I’m so glad we were able to take pictures of this sweet family of three. I’m sure they’ll treasure these precious photos of their new family for years to come! I’m also so glad I’ll be able to continue photographing and getting to know this cute family, because they purchased my baby plan—a portrait membership that includes a special rate on multiple sessions. Just last week I met up again with Liam and his parents for his sitter milestone session, and we’ll meet again in the spring to celebrate his first birthday with portraits in the cherry blossoms in Central Park.